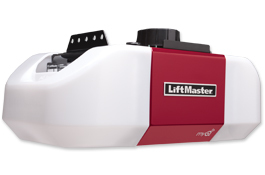 The DC Belt Drive Garage Door Opener (model #8550W) from LiftMaster lives up to the manufactures repetition for delivering exceptionally performing products that are aimed towards homeowners seeking power without all the noise. In fact, this model garage door is 75% quieter than many of the other garage door openers on the market today, namely those of the chain drive variety. This makes it perfect for those that have garages adjacent to a bedroom or other living area – you’ll love that the fact that this opener won’t disturb you every time it is activated. Security+ 2.0 safeguards your home whether you’re at home relaxing or away. With each press of the remote, you’re provided with a different code, thus making it virtually impossible for someone to steal your code and gain entry into your home. Alert-2-Close provides audible and visual warning signals when the garage door is about ready to close when using MyQ technology or Timer-to-Close features (which remembers to close the door should you forget). Make fumbling in the dark a thing of the past with LiftMaster’s built-in motion detector, which activates the opener’s light as soon as you enter and deactivates it shortly after you make your way back into your home safely. The Protector System projects an invisible light beam that diligently watches for any movement. If movement is detected – whether it’s a child, pet, ball or car – the protector system will immediately instruct the opener to reverse its operation and turn on the light.